First off, I apologize for barely existing over the last three days. It was my friend's birthday and my family was in town, so I've had about zero free time. On the plus side, the Irish won! On the minus side, I still have to follow all you lovelies who visited me on Friday. Fear not! I will get to that tonight or tomorrow. And if I miss you, just poke me with something sharp. Nice haul! 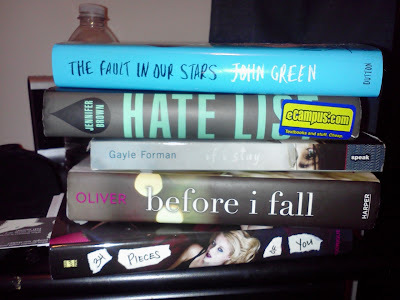 Looking forward to your review on The Fault in Our Stars, as I've got that one on my TBR pile. And hope you enjoy Before I Fall as much as I did. Enjoy! That'll be up today! Tomorrow? Whatever day is Tuesday where you are. (Spoiler: it was amazing!) I think I might read Before I Fall after I finish 34 Pieces of You. Great books this week! I loved If I Stay & Before I Fall! Also got myself a copy of 34 Pieces of You. I'll be reading it next week! Yay! If you loved them then I know I'll also love them. I'm reading it now! It's good so far but not quite as amazing as 13 Reasons Why. If 34 Pieces is anything like 13 Reasons Why then I'm all in! That's my hope! I'm trying not to compare it TOO Much though, cause I want to give it a fair shot and 13 Reasons was just brilliant.